Dos Chinos on Dos Wheels: Bread! So I was in the mood to find an alternative, and baking it myself seemed the best option. People have suggested I get my own breadmaker, but for those who've seen our kitchen: ain't gonna fit... and besides, mankind has made bread for ages without the assistance of a bread maker! 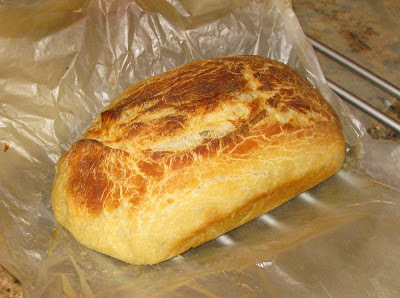 Last June while in the States, I picked up a mix of 10-grain stuff to make a loaf, and I still have to try it. But even if it's good, even if it's delicious, we can't get the stuff here, and shipping it over is just plain ridiculous, just for some bread. Doesn't that just make your mouth water? I did with us! And it not only looks delicious, but the taste was awesome!!! We'll be doing this more often! Go ahead, friend-cooks of mine, give it a try. It will not disappoint! Look at those colors! 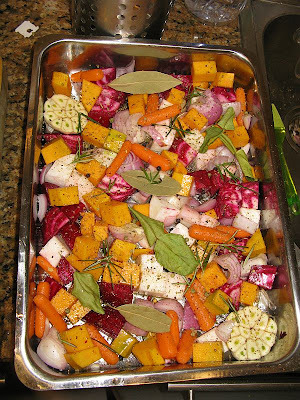 It's called Roasted Autumn Vegetables, in honor of the fact it is autumn (although it's hard to tell here in Abu...). It had, among others, pumpkin, carrots, onions, garlic, parsnips, red beetroot, drizzled with a little olive oil, bay leaves, rosemary, thai curry leaves and some peppercorns. A treat!